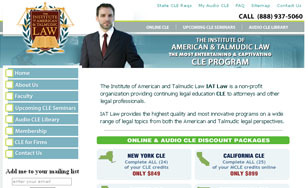 The Institute of American and Talmudic Law (IAT Law) is a non for profit organization providing continuing legal education to attorneys and other professionals. IAT Law provides innovative programs on a wide range of topics while comparing American and Talmudic Law. This New York website by Bitochon features an Ecommerce design that enables students to log in at any time, browse, and purchase courses. Once a student listens to a specific comprehensive course they receive education credits, which are stored by the system. Additionally, students can log into the system at their convenience and listen to different lectures. The site design encompasses credit card processing and an administration front-end to manage credit assignments, member log ins, coupons and orders.